The New York City Department of Environmental Protection (DEP) today announced that funding provided through New York City’s Green Infrastructure Grant Program is now available citywide. Green infrastructure, such as rain gardens, porous pavement and green roofs, softens the city’s built environment, allowing stormwater to be naturally absorbed into the ground where it falls. Reducing the amount of stormwater that drains into the City’s sewer system is a cost-effective way to reduce pollution in local waterways. The Green Infrastructure Grant Program provides funding for green infrastructure projects on private property, and for the first time this resource will be available to property owners on Staten Island, in eastern Queens and in the immediate vicinity of Newtown Creek. “Stormwater management improvements to public property, while valuable, can only go so far in addressing community needs. DEP’s Green Infrastructure Grant Program will allow private property owners to better their land and structures while also contributing to their neighborhood’s stormwater infrastructure, and I’m glad the program is coming to Staten Island,” said Congressman Daniel M. Donovan, Jr. Since 2011, DEP has committed over $15 million to fund 34 different green infrastructure projects with private property owners. More information and the application can be found on the DEP website. Ancillary environmental and community benefits of green infrastructure include increased shade, decreased energy use for cooling buildings, increased awareness about stormwater management, and/or green jobs development. In previous years, only properties in areas of the city served by combined sewers have received green infrastructure grant funding. The Green Infrastructure Grant Program is now open to all private property owners in New York City. Funding is limited and will be awarded on a first-come, first-served basis upon acceptance and approval of complete applications. The Grant Program will consider applications for projects that will reduce or manage a minimum of 1″ of stormwater runoff that falls on the property. If selected, DEP will reimburse up to the full costs for the design and construction of the green infrastructure project. Consideration will be given to projects that are cost-effective, provide matching funds or other contributions, and include training and workforce development. Expanding the Green Infrastructure Grant Program will allow more participation in the program and provide all private property owners the opportunity to join DEP in improving water quality in New York Harbor. DEP hosts quarterly workshops at Civic Hall located at 118 West 22nd Street, 12th floor in Manhattan. Each workshop will explain the eligibility requirements and the application process. The next workshop of 2017 will be held on September 13th at 3pm. 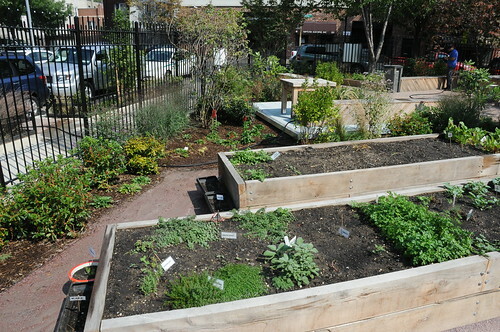 To RSVP or view dates and times of future workshops, visit nyc.gov/greeninfrastructure. Interested parties can also email gigrantprogram@dep.nyc.gov to arrange a call to discuss proposal specifics in advance of submitting an application. DEP manages New York City’s water supply, providing approximately 1 billion gallons of high quality drinking water each day to more than 9 million residents, including 8.5 million in New York City. The water is delivered from a watershed that extends more than 125 miles from the city, comprising 19 reservoirs and three controlled lakes. Approximately 7,000 miles of water mains, tunnels and aqueducts bring water to homes and businesses throughout the five boroughs, and 7,500 miles of sewer lines and 96 pump stations take wastewater to 14 in-city treatment plants. DEP has nearly 6,000 employees, including almost 1,000 in the upstate watershed. In addition, DEP has a robust capital program, with a planned $20.7 billion in investments over the next 10 years that will create up to 3,000 construction-related jobs per year. For more information, visit nyc.gov/dep, like us on Facebook, or follow us on Twitter.